Described by one historian as “a vicious and abandoned character, low, brutal, and cruel, intrinsically and at heart a thief and a cut-throat,” Joaquin Murieta may have been all those things. But who was Joaquin Murieta, the man? And who was Joaquin Murieta, the legend? 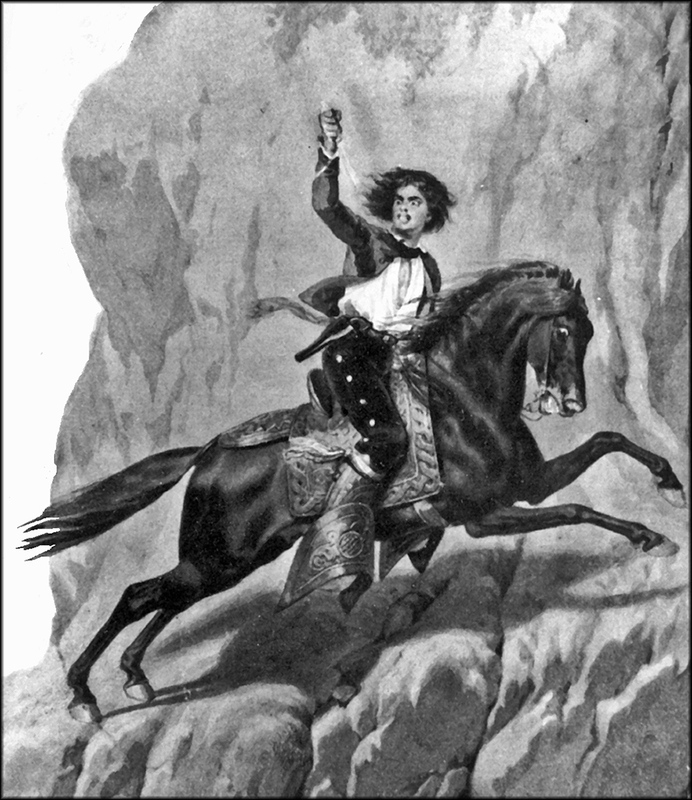 Joaquin the legend grew from a novel written by John Rollin Ridge in 1854, The Life and Adventures of Joaquin Murieta. In his book, ridge portrays Murieta as a folk hero, a man of “generous and noble nature … gracefully built and active as a young tiger … beloved by all with whom he came in contact.” He only turned to a life of crime after American miners (choose one): beat him, tied him up, hanged his half-brother and ravished his sister. After these atrocities he declared that he would henceforth “live for revenge, and that his path would be marked with blood.” Ridge then goes on to relate of Joaquin’s daring deeds, his fearsome companions such as the notorious Three-Fingered Jack, the public outcry, the formation of Harry Love’s Mounted Rangers to hunt him down, and of Joaquin’s gruesome, bloody fate. But Joaquin the man was not the dashing, romantic figure that years of retelling Ridge’s story has made him out to be. When the Foreign Miners Tax was imposed in the early 1850s, Joaquin was apparently forced off his claim, as were most of the Mexican and Chinese miners in the Southern Mines. Soon afterwards, several groups of Mexican bandits, presumably miners dispossessed by their white, American counterparts, began preying upon those who had forced them from the mines. Cattle and horses were stolen, travelers and lone miners were robbed, beaten and even killed. Stores and saloons were broken into. Something had to be done to end the reign of terror. By piecing together various reports, it was determined that the most notable banditos among these groups all seemed to be named Joaquin, with surnames such as Botilleras, Ocomorenia, Valenzuela, Carillo, and Murieta. The State Legislature passed an act authorizing one Harry Love to raise a company of mounted rangers in an attempt to capture the “gang of robbers commanded by the five Joaquins.” Governor Bigler approved the act on May 11th of 1853, and then personally posted a $1,000 reward for any Joaquin captured or killed. Needless to say, there wasn't much accountability attached to this reward and it seems to have turned into open season on Joaquins. Two months later, the rangers ran across a group of Mexicans near Panoche Pass, to the west of Tulare Lake and about one hundred miles from the Southern Mines. Words were exchanged and rapid gunplay ensued, resulting in the death of two Mexicans. The rangers lopped off the head of one and stuck it in a jar of alcohol for preservation, claiming it to be the head of Joaquin Murieta. The other body gave up a hand, similarly preserved, which was said to have belonged to the nefarious Three-Fingered Jack. The detached appendages were then presented to the authorities, who despite no positive identification being possible, proclaimed the matter settled and paid the reward. The severed “Head of Murieta” and “Hand of Jack” then hit the road, becoming a main attraction for many years at locations throughout the western states. To this day, no ones knows if the men killed were even actually outlaws. The entire episode, including the “Foreign Miners Tax,” shows the amount of racism and greed that existed during the Gold Rush. Everything wasn't as golden as history books sometimes makes us believe. Non “American” miners had a very difficult time in California during those early years. But in spite of the obstacles, they persevered and carved out their own place in the Golden State.